The Quarry is a room inside the Old Clockworks in Luigi's Mansion: Dark Moon. The Quarry is accessed by taking the north door inside of the Pit Slide. This is a large room that spirals downward. There are broken mine cart tracks on the ground and a large wooden tower in the background. On the ground level, there are two holes on the west and east sides and a mine cart that can be tugged on. At the top, there is a treasure chest and a door that leads to the Antechamber. During C-2: Underground Expedition, Luigi needs go into the Quarry to raise the sand so he can reach the door to the Antechamber. He needs to tug the mine cart so it gets lodged in the hole in the middle. This causes the sand to stop falling into the hole below and starts filling up the room instead. During the time the sand fills up the room, Luigi needs to battle several ghosts. First, Luigi needs to capture two Greenies. After, three Greenies with shovels and two Greenies that create sand tornadoes attack Luigi. The final wave of ghosts consists of three Sneakers. After the sand fills up, Luigi is able to access the Antechamber. 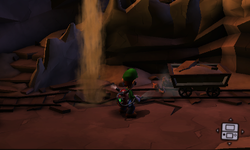 In the same mission, after Luigi fills the room with sand, he can shine his Dark-Light Device on the gap between the two rock paths. This reveals a bridge, and after capturing the Spirit Balls, this mission's Boo appears as well. Crossing the bridge after defeating the Boo takes Luigi to a treasure chest filled with coins, bills, and Gold Bars. Only during C-2: Underground Expedition, Luigi can enter the right cavern to see three gold bats and a ruby behind a spider web. Pulling off the web drops the ruby for Luigi to add to his collection.